Cryo Express shippers are designed to safely transport a variety of materials at cryogenic temperatures. The unique adsorbent material prevents a liquid spill if the unit is tipped over. Storage temperature inside the shipping cavity remains at approximately -190°C until the liquid nitrogen evaporates from the absorbent material. Every CX model is backed by a 3 year warranty when purchased from L&G Cryogenics. For specific information on each model see the document at the bottom of this page. *If extra charges apply (International Shipping or Taxes), you will receive an additional invoice through PayPal. Safely transports materials at cryogenic temperatures. Comes with sturdy cardboard shipping case. See specification sheet at the bottom of page for more details. Static Holding Time: 22 Days Overall Height: 18.4 in. Working Time: 17 Days Overall Diameter: 9.2 in. 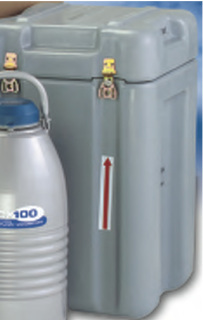 The CXR100 differs from the CX100 in that it's LN2 adsorbent material can be replaced in needed. It also has a lower static holding time. Static Holding Time: 16 Days Overall Height: 19.4 in. Working Time: 11 Days Overall Diameter: 9.2 in. 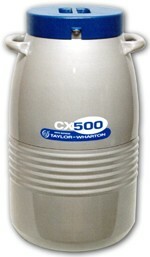 The CXR500 is capable of having it's LN2 adsorbent material replaced if needed. Static Holding Time: 11 Days Neck Diameter: 8.5 in. Working Time: 7 Days Overall Height: 26.9 in. 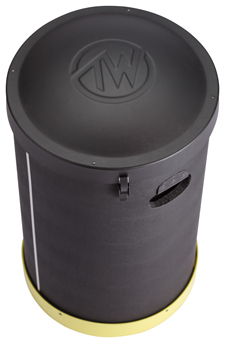 Evaporation Rate: .64 Liters/Day Overall Diameter: 15.5 in.